Seven years have passed since Mina Tepes' triumphant return to the Bund. The year is now 2020, and Tokyo is hosting the Summer Olympics with Mina as guest of honor at the opening ceremonies. During her speech, terrorists infiltrate the stadium and demand that she close the Bund and remove all vampires from Japan. In front of TV cameras, Mina and her loyal werewolf bodyguard Akira must confront the terrorists, while ensuring the safety of human bystanders. 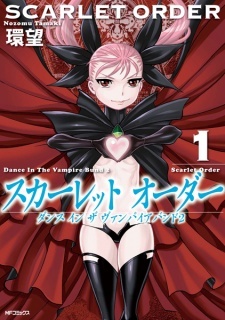 Scarlet Order: Dance in the Vampire Bund 2 was published in English by Seven Seas Entertainment from December 16, 2014 to March 8, 2016, and again in the publisher's 7th Dance in the Vampire Bund omnibus on December 12, 2017. Sequel: Dance in the Vampire Bund A.S.O. I have to say that out of the entire series of this manga, this was by far the one i have enjoyed the most. Compared to the other ones, I feel like the story had an overall great flow, and in comparison to the other ones, it did not seem like it was dragging on. As well as that, the fact that there was a back story of what actually happened to Mina's mother was good as well. Not only that, I feel like overall, the characters have developed so much more, in Scarlet Order, than they have in the previous two manga's. I do have to say, that even though this was by far the best manga from this series, I still feel like overall Dance in the Vampire Bund, simply has too much dialogue. It's not so much I hate it, but the fact that as a reader it seems like we are thrown a lot of dialogue to process, at once. Of course I'm not discouraging anyone from reading this, as the series is good, but if you can't keep the focus on long pieces of dialogue, then I suggest you take this manga bit by bit. Regardless, story was good, the overall development was also good, and the fact that the continuation, did not drag on, instead it dwelled further into the storyline. Recommend highly if you enjoy vampire stories.